UNCW professor emeritus Robert Tyndall has received a 2017 Lifetime Achievement Award from StarNews Media in recognition of his 45-year career as a leader in education. 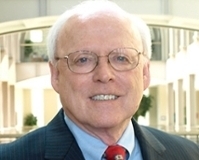 Tyndall began his career as a teacher and held roles of principal and school superintendent before joining UNCW in 1989 as a professor. He was dean of the education school from 1991 to 1999 (later renamed the Watson College of Education). He also served as associate provost, vice chancellor for information technology, vice chancellor for public service and continuing education and executive-in-residence at UNCW’s Cameron School of Business prior to his retirement earlier this year. The StarNews Media Lifetime Achievement Award was established in 2003 to honor outstanding individuals who have given substantially of themselves for the improvement of Wilmington and Southeastern North Carolina, particularly in the areas of economic development, education, charity, health, preservation, arts and the environment. Read the full story on the Watson College of Education website.